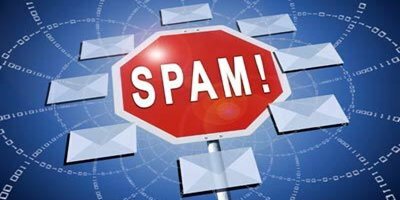 Spam is a common word these days as our mailbox is flooded with these stuffs every day.Spammers use these trick to promote their product and sometimes compromise an account.Gmail is using the DKIM authentication in the email header to authenticate a mail from a real sender.Now the google has again come up with a new step to fight against the spam by introducing DKIM authentication for its google apps users that too free of cost and with manual enability. Here in this post we will discuss how to enable "DKIM authentication" in Google Apps. Domain key identified mail(DKIM) is a mechanism in which an email header is authenticated with a digital signature so that it cannot be tampered in the path.To know more on it read my post on it. *Add public domain key to the DNS records of domain. * Turn on DKIM authentication. 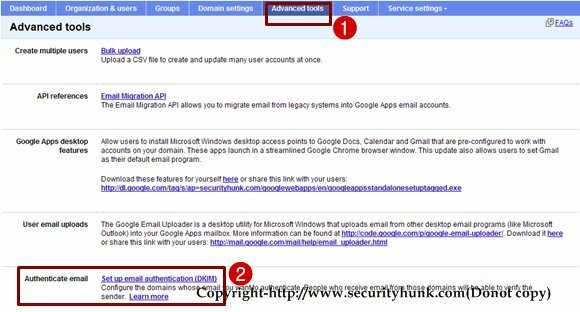 Login in to the Control panel of Google Apps and in the "Advanced tools" scroll down to "Authenticate email" as shown in the image below. Click on "step up email authentication" then enter the desired "prefix selector" and click generate as shown in the image below. 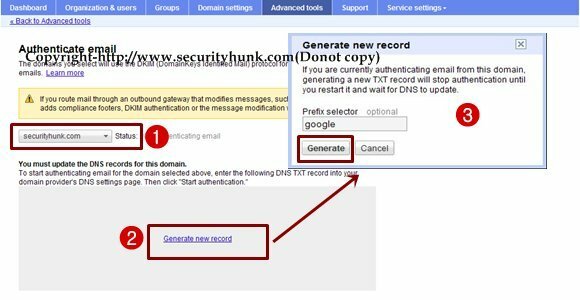 After you click on the "Generate" button in the previous step a "DNS hostname" and "TXT record value" will be created as shown in the image below.But donot click on the "Start Authentication" button,as it will be clicked after finishing all the left steps. Add public domain key to the DNS records of domain. Now Login to the admininstrator account of the Domain service provider. Now in the DNS record page add a TXT record with the value as shown in the image above and save it. Now having completed all the steps now click on the "Start Authentication" button shown above.